The eight Buccaneer outboard motor models for the current year will be painted Sea Mist Green and Surf White as styled by Brooks Stevens. Baby of the line is the 32 lb., 3 hp. deluxe. This and the 5 hp. standard have 360 degree pivot for maneuvering. The 5 hp. deluxe combines steering and speed control in its master control tiller. The basic 12 hp. power plant is available in standard, deluxe and electric starting models; the 25 hp. in a manual or an electric starting motor. Remote controls for throttle, shift and steering can be installed on all except the 3 hp. and 5 standard. Remote six-gal. fuel tanks are accessories for 5 hp. deluxe and 12 hp. standard models. 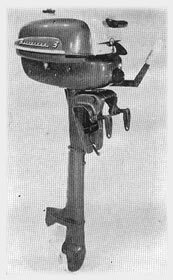 Outboard Pictured: The 3 hp. Buccaneer weighs but 32 lbs. ; has 360 degree pivot and auto-wind starter. Manufacturer: Gale Products, Galesburg, Ill.